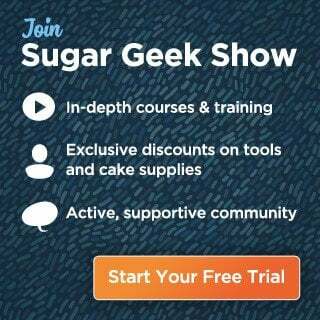 Learn how to make beautiful edible oil paints. 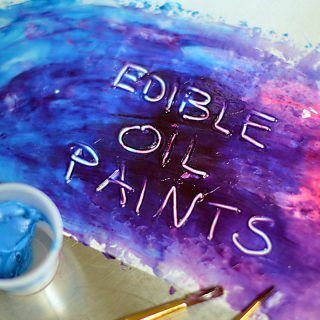 A great recipe to create your own edible oil paints which work just like real oils, but are completely edible and usable on cake designs. Place the vegetable shortening on a piece of parchment paper. Sprinkle food coloring onto the vegetable shortening. Use an offset spatula to blend the color and shortening together, smashing the vegetable shortening down, then scraping up the color and shortening mix, and smashing it down again, to make sure the color thoroughly mixes with the shortening. Add more food coloring as needed until you have reached the desired color. If using edible oils with a stencil to apply a design to a cake, you need to buff the color off first before taking the stencil off the cake. Use a paper towel or facial sponge to lightly dab the color so that when you take the stencil off the cake it won't disrupt the design.